Officer talking with men about Vietcong counterattack. MS, CU, medic administers aid to a badly wounded and frightened soldiers. Soldiers running to positions where the Vietcong broke thru the perimeter. VS, aidmen treating seriously wounded soldiers. Wounded are helped to helicopters. UH-1Ds take off Officers speaks over AN/PRC-25 radios. Dead American soldiers are carried in ponchos to area where other dead are already covered. MS, CUs, Capt Bob Carrara, Bn surgeon performs a tracheotomy on a badly wounded soldier in a desperate attempt to save his life. Other soldiers are grouped around. (Excellent scenes of the hopelessness of the Situation). VS, dead soldiers are placed on ponchos and carried to copters. Wounded soldiers being treated. Dead soldiers bieng piled into UH-1Ds. Helicopters take off. 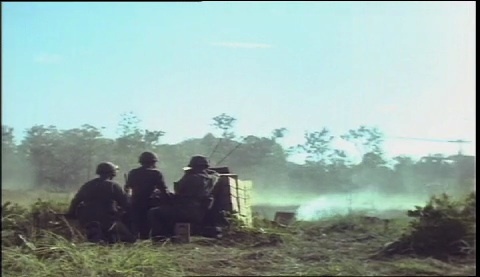 Chicago: “Vietnam: A Television History; Operation Long Reach, 1st Air Cavalry Division,” 11/14/1965, WGBH Media Library & Archives, accessed April 24, 2019, http://openvault.wgbh.org/catalog/V_7249EB03C1B14B4792F903F2ADB14E12. MLA: “Vietnam: A Television History; Operation Long Reach, 1st Air Cavalry Division.” 11/14/1965. WGBH Media Library & Archives. Web. April 24, 2019. <http://openvault.wgbh.org/catalog/V_7249EB03C1B14B4792F903F2ADB14E12>.